403 Beacon is located on the south side of Beacon, between Gloucester and Hereford, with 401 Beacon to the east and 405 Beacon to the west. 403 Beacon was built ca. 1867 as the home of architect James R. Gregerson, one of five contiguous houses (401-403-405-407-409 Beacon) designed by his firm, Snell and Gregerson. Click here for an index to the deeds for 403 Beacon. James Gregerson lived at 403 Beacon with his sister, Elizabeth (Lillie) Sharp Gregerson, and their mother, Elizabeth Withington (Sharp) Gregerson, widow of Dr. James Gregerson. They previously had lived in Chestnut Hill. Elizabeth (Sharp) Gregerson died in January of 1898, and James Gregerson died one month later, in February of 1898. Elizabeth Gregerson continued to live at 403 Beacon until her death in 1918, but frequently traveled or lived elsewhere, and leased 403 Beacon to others. The house was owned by her brother’s and mother’s estates, with her first cousin, George Henry Loring Sharp, as trustee and executor (he was the son of Elizabeth Gregerson’s maternal uncle, Daniel Sharp, and his wife, Mary W. (Sawyer) Sharp). In 1900, Elizabeth Gregerson was traveling abroad and 403 Beacon was the home of Col. Henry Sturgis Russell and his wife, Mary Hathaway (Forbes) Russell. They previously had lived at 24 Commonwealth. They also maintained a residence, Home Farm, in Milton. Col. Russell was Boston Fire Commissioner; he formerly had been a shipping merchant in the East India and China trade in his father-in-law’s firm, John Murray Forbes & Co., and had served as president of the Continental Telephone Company. By 1901, they had moved to 281 Beacon. 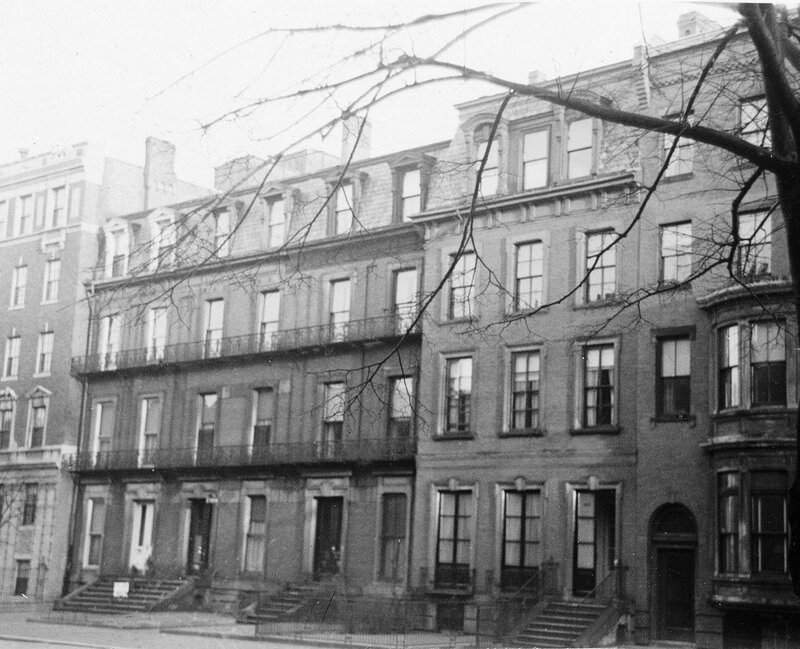 Elizabeth Gregerson had resumed living at 403 Beacon by the 1900-1901 winter season, but during the 1901-1902 season she was traveling in Europe and 403 Beacon was the home of Mrs. Marie Louise (Mudge) Joy, the widow of dry goods commission merchant Charles Henry Joy. Earlier in 1901, she had lived at 86 Marlborough (which had been her home since the early 1870s), and she was living there again by the 1903-1904 season. During the 1902-1903 winter season, 403 Beacon was the home of Mrs. Isabella Morgan (Rotch) Severance, the widow of window glass importer and dealer Pierre Clarke Severance, and their daughter, Emily Morgan Severance. By the 1903-1904 season, they were living at The Abbotsford at 184 Commonwealth. In 1904. 403 Beacon was the home of Edwin Sherrill Dodge, an architect, and his mother, Katharine Searls (Gray) Dodge, widow of Elisha Perkins Dodge. They previously had lived in Newburyport (where Elisha Dodge died in September of 1902). They had moved from 403 Beacon by the fall and, in November of 1904, Edwin Dodge married in Paris to Mrs. Mabel (Ganson) Evans. Elizabeth Gregerson resumed living at 403 Beacon in 1904, but in November of that year, she again went abroad, to Europe, where she remained for several years. By mid-1905, 403 Beacon was the home of William Henry Bowker, President of the Bowker Fertilizer Company, and his wife, Charlotte Jeanette (Ryder) Bowker. They had lived at 441 Marlborough in 1904. They continued to live at 403 Beacon in 1906, but had moved to Concord by 1907. By the 1906-1907 winter season, 403 Beacon was the home of Mr. and Mrs. Charles R. Smith. They continued to live there in 1908. By the 1908-1909 winter season, Miss Gregerson was living there once again, and continued to do so through the 1915-1916 winter season. She died in 1918. 403 Beacon was not listed in the 1916-1919 Blue Books. On February 11, 1919, 403 Beacon was acquired from the estates of James Gregerson and Elizabeth Gregerson by Susan Mason (Lawrence) Loring, the wife of William Caleb Loring. They lived at 404 Beacon. The Lorings appear to have acquired 403 Beacon for the purpose of adding a deed restriction prohibiting any owner of 403 Beacon from increasing the height of the building and from allowing openings in the party walls between 403 Beacon and the buildings on either side if those buildings exceed the height of the building at 403 Beacon. 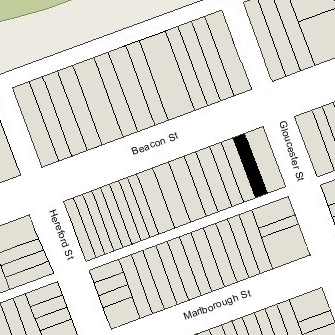 The restriction was “imposed for the benefit of the estate of said Susan M. Loring on the corner of Beacon and Gloucester Streets” and was to have remained in effect until January 1, 1950. The restriction was removed on August 21, 1936, by William Loring’s nephew, Augustus P. Loring, Jr., and his wife, Rosamond (Bowditch) Loring, who had acquired 404 Beacon from Susan Loring’s estate. On February 14, 1919, 403 Beacon was acquired from Susan Loring by Harriet Cutler (Cunningham) Binney, the wife of Dr. Horace Binney. Susan Loring was Harriet Cutler’s maternal aunt (Susan (Lawrence) Loring’s sister, Hetty Sullivan (Lawrence) Cunninham. the wife of Frederic Cunningham, Jr., was Harriet (Cunningham) Cutler’s mother). Horace Binney was a physician and surgeon, and later would become a professor at Tufts Medical School. He maintained his medical offices at 403 Beacon. In 1917, the Binneys had lived at 150 Mt. Vernon and he had maintained his medical offices at 205 Beacon. He had then served in the US Medical Corps in France. They also maintained a home in the Readville section of Milton. In April of 1919, Harriet Binney applied for (and subsequently received) permission to extend a dumb waiter to the second floor and make other interior alterations. In April of 1920, she applied for (and subsequently received) permission to convert the existing stable at the rear of the house into a garage. The Binneys continued to live at 403 Beacon until about 1933, when they moved to Milton. 403 Beacon remained his medical offices until about 1936, when he moved them to 370 Commonwealth. On September 1, 1936, 403 Beacon was purchased from Harriet Binney by Anna Pollack. On December 16, 1936, 403 Beacon was acquired from Anna Pollack by Mrs. Eva Mae (Buchanan) Chase, the former wife of George Woodman Chase. She held the property in a trust, with herself as trustee, for her benefit and, after her death, the benefit of her eight children, who lived with her: Nedra Viola Chase, Inda Chase, Laurene Lydia Chase, Wallace Woodman Chase, Duane Buchanan Chase, Madora Ruth Chase, Lauris Howard Chase, and Adeane Phyllis Chase. They previously had lived in Wilmington, Massachusetts. Nedra Chase married in 1937 to Robert Fish and moved elsewhere. On July 24, 1937, the Abington Savings Bank foreclosed on its mortgage to Eva Chase, but the property was acquired by her daughter, Inda Chase. Eva Chase and her unmarried children (including Inda Chase) continued to live there in 1938. On August 26, 1938, the Abington Savings Bank foreclosed on its mortgage to Inda Chase, and took possession of 403 Beacon. 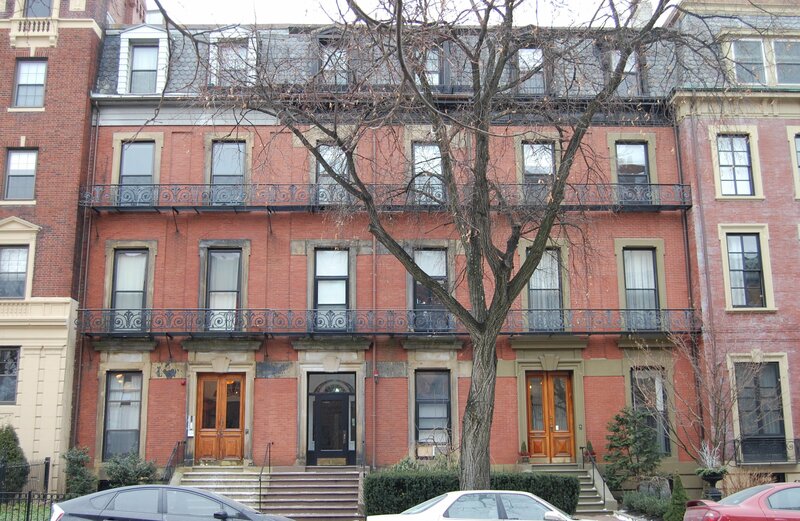 Eva Chase and her children moved to 815 Beacon, where they lived until about 1945, when they moved to 116 Commonwealth. 403 Beacon was shown as vacant in the 1939 City Directory. The Abington Savings Bank was the assessed owned from 1939 through 1941. By 1940, 403 Beacon was the home Harry T. Gross and his wife, Dr. Margaret Elizabeth (Carley) Gross. They previously had been lodgers at 294 Commonwealth. Harry Gross was a retired importer. Margaret Gross was a physician and practiced under her unmarried name. Margaret E. Carley. They operated 403 Beacon as a lodging house and she also maintained her medical office there. Harry Gross died in February of 1941. On November 15, 1941, Margaret (Carley) Gross acquired 403 from the Abington Savings Bank. She continued to live and maintain her office at 403 Beacon until her death in October of 1949. By 1951, 403 Beacon was the home of Margaret Gross’s brother-in-law and sister, George L. Murray and Mary Esther (Carley) Murray, who operated it as a lodging hosue. Mary Esther Murray had inherited the property from her sister. They previously had lived in Fitchburg. Mary Esther Murray died in 1953. George Murray continued to live at 403 Beacon and, in 1953, married again, to Eleanor B. (Vincent) Morehouse, On April 22, 1954, he transferred the property into both of their names. They continued to live there until about 1955. On February 17, 1955, 403 Beacon was acquired from George and Eleanor Murray by Donald W. Westwater, an attorney. He and his wife, Ruth (Bouzan) Westwater, a nurse, continued to operate it as a lodging house. They had married in 1955 and 403 Beacon probably was their first home together. They continued to live there until about 1959. On September 15, 1959, 403 Beacon was acquired from Donald Westwater by James Glynn. On December 20, 1959, it was acquired from James Glynn by real estate dealer Patrick J. Glynn. He and his wife, Anne T. Glynn, made it their home and operated it as a lodging house. On April 8, 1964, he transferred the property into both of their names. They continued to live at 403 Beacon until the late 1960s, when they moved to Arlington. They continued to own 403 Beacon. In January of 1974, they filed for (and subsequently received) permission to legalize the occupancy as a lodging house, indicating that it had been a lodging house for about fifteen years. 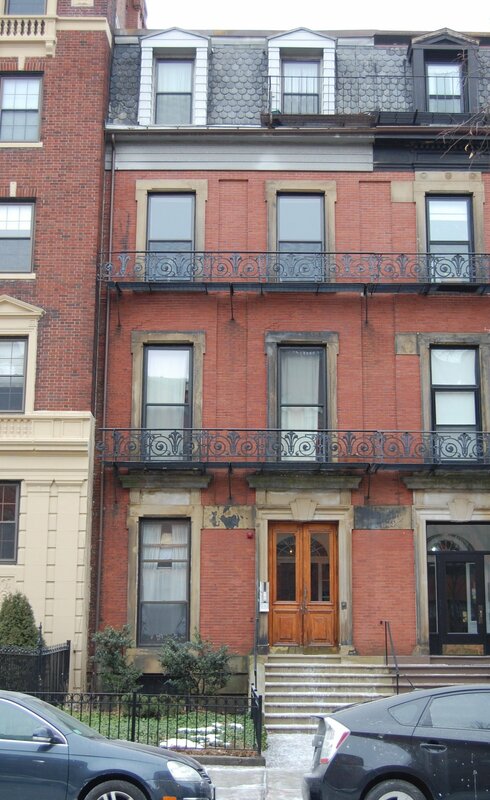 On January 22, 1991, they transferred the property to themselves as trustees of the 403 Beacon Street Trust. In November of 1994, they applied for (and subsequently received) permission to convert the property from a lodging house into ten apartments. On December 31, 1996, they transferred the property to Glynn Realty Associates II, LLC. 403 Beacon remained an apartment house in 2015.